I found Judy L’s (Patchwork Times online) monochromatic challenge for the month of January intriguing – Yellow! Yellow! Who makes a full yellow quilt? 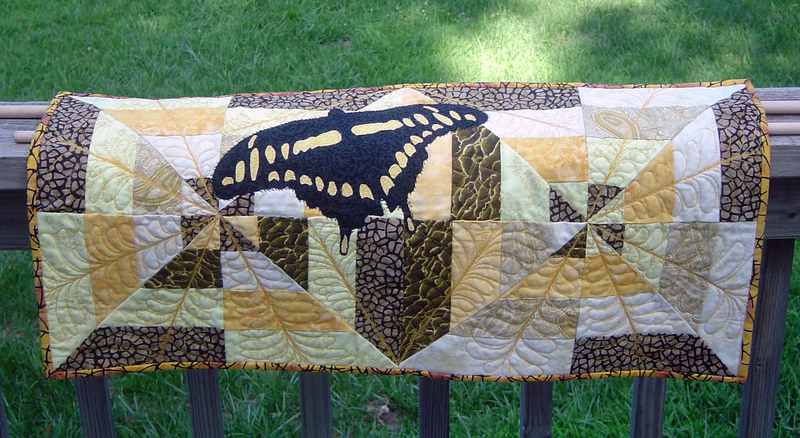 Using Bonnie Hunters (Quiltville) Strip Twist pattern as inspiration, I made the 2 blocks (limited in size by my lack of yellow fabrics) and then found a black and yellow butterfly on my calendar, so I traced and appliqued it onto the top. I was inspired to make the style of cover by flossie blossom (on flickr) but wanted a machine cover that had the words “make it sew”. 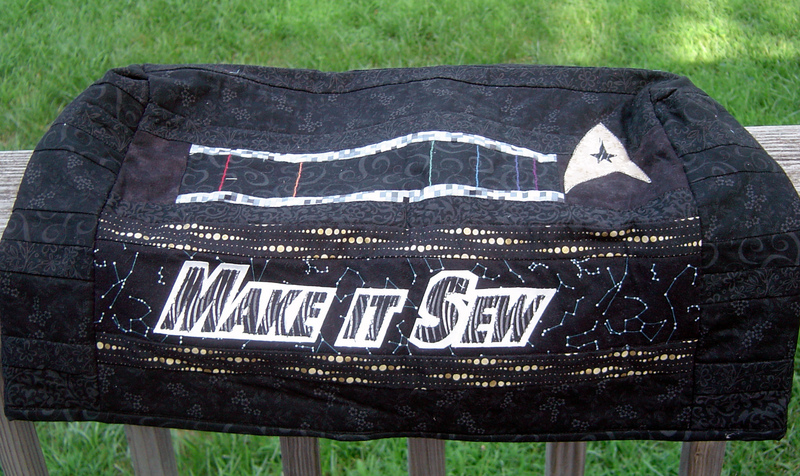 Make it sew is a play on Start Terk Next Generation Captain Piccard’s famous line “Make it so” So I added the Star Trek emblem to the front. I had wanted to complete a spectrum quilt, and on Star Trek they refer to ‘dilithium’ a lot, so the embroidery on the front and back is dilithium – 2 lithium spectra. The hole in the back is perfect fit for my machine. 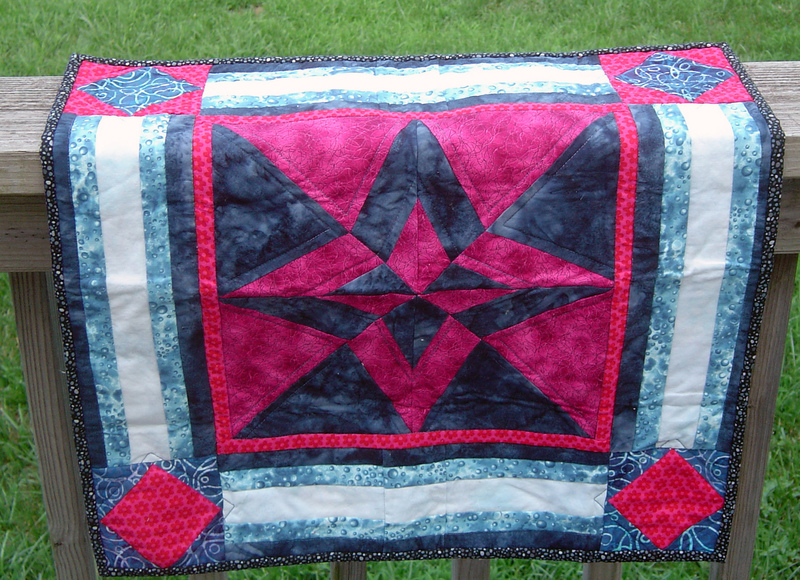 This is the first quitl I hand pieced which was a breeze. 1-2 sides a day every day after lunch, this took a while to piece, but I enjoyed doing it. 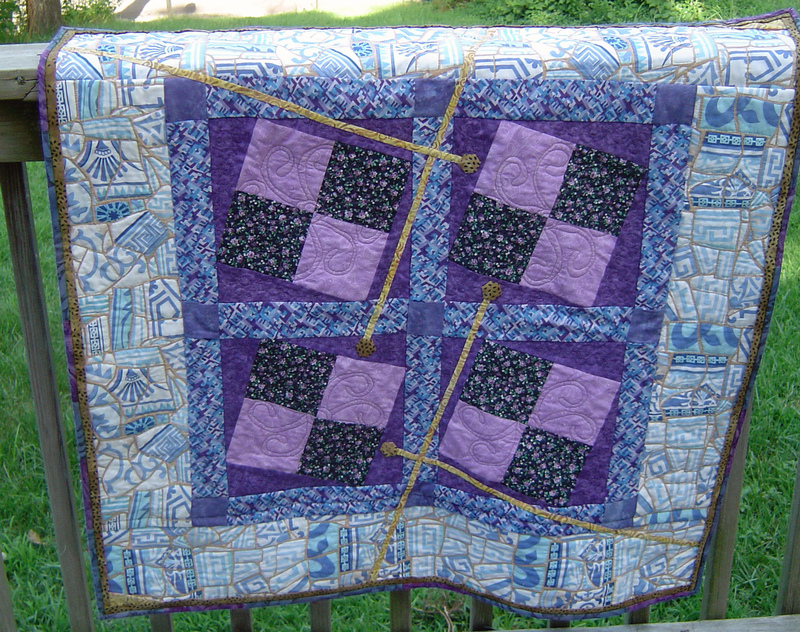 Pattern was absolutely perfect for my round table and then I got rid of the table 2 months after completing this quilt. 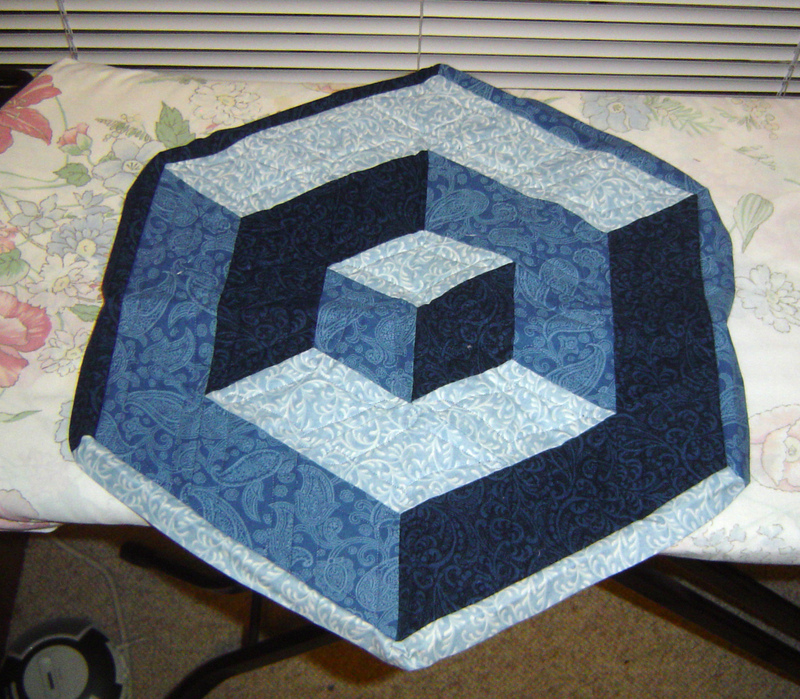 This was a swapped block from quilterscache.com as the first swap of a group of Quilting podcasters and listeners. 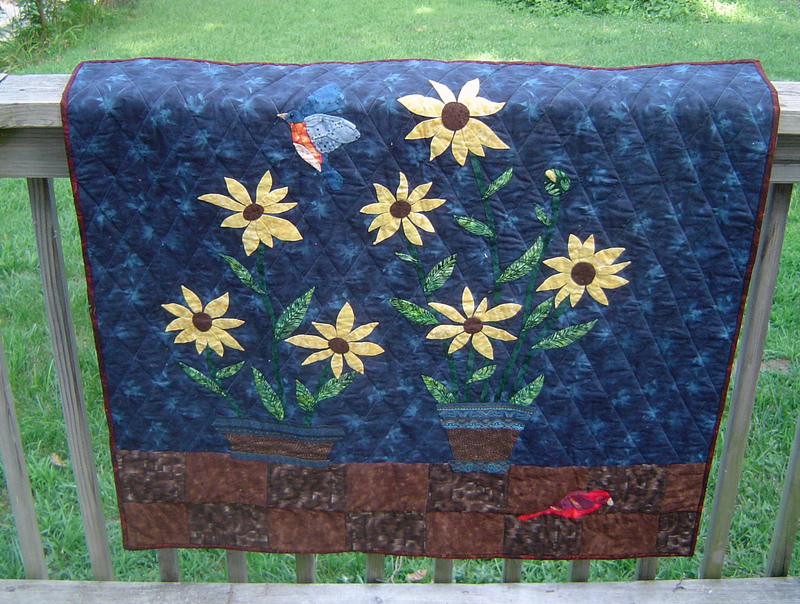 Sandi (Colwell) pieced the tilted 4 patch blocks and I sashed the blocks and added the applique which I designed. This quilt is my first attempt at quilt-as-you-go technique which caused some issues. The gold hexagons I call ‘tribbles’ because they were multiplying like crazy for another project. Even they could not stay away from this quilt. The leaves and the flower petals were from a pattern called “Delightful Daisies” by Bee Creative Studio which I muiltiplied, created a bud that was opened. I designed the two flowerpots myself, using one of my flower pots as inspiration. The birds are from ‘Award Winning Applique Birds’ by Panela Humphries and I envisioned this (quilt scene) as if I was looking out the window on a patio. After searching online the daisies I made were way more like sunflowers which caused some confusion for a while on the title. Will try to get a podcast around the ‘behind the scenes of a quilt show” by podcasting a little each day the next few days. The Quilt Show starts Friday at Eudora Middle School and goes through Saturday afternoon. This week, like one of every 5 weeks, I have a saturday off on a tuesday. It feels surreal and wonderful to go to work on monday – usually the busiest day of the week for my shift – and then automatically have the next day off. And actually, I was ultra lucky because I preplanned for my quilt guild meeting tonight and took tomorrow off in advance too! 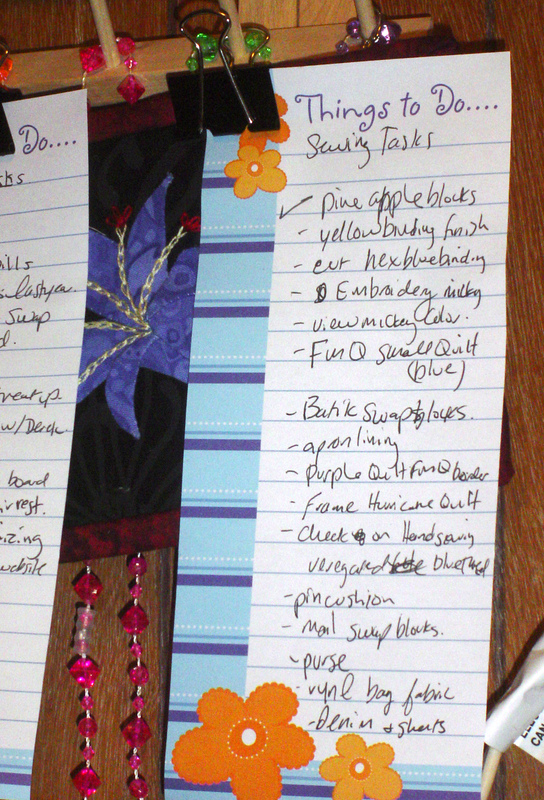 This all means that I have had time to complete things on my lists. I really need to brush up on my handwriting. We’ll see how the list thing goes. In the past, I have written lists and it has paralyzed me. But I have matured. Maybe. This past Sunday, I saw this amazing book that my friend has a pattern in, which I’m going to have to pick up, there are lots of great small projects in this book. The other friend who also works in the quilt shop was trying to get information about the quilt shop picking up the book, so maybe I’ll wait until I see it there and help a whole bunch of people out instead of just helping out Barnes and Noble or Amazon. Or since the other friend works in the interlibrary loan department of her library, perhaps I should check it out instead. I’ll give you more details as I know them. Right now I have to go to the one blog to remember the title and stuff. I always ask (and usually forget, so most likely re-ask) about the process of being a designer, how long it takes, how the contracts work, how/if the magazines or books retain the rights to the pattern. It’s been fascinating to learn. The other friend who was at the table at the time is a tech editor for a book company, and there was talk about book ideas and copyright, corporate espionage (… well not exactly, but I threw that in to see if you’re paying attention) and all sorts of stuff about do you speak about a book project or not. Just to make it clear, at this time, I have no intention of going down the book road … but I wouldn’t be opposed to going down a book road in a few years or so … if anything happens and I can actually create real life patterns for people that will sell. At the sewing day I finished measuring and sewing the front on my tumbling block table runner. Because of how I ignored the mitered corner trick, I introduced ‘pookers’ in the corners. I had just read a yahoo group explanation of how to handle this too … days before this was done. And the author of the group solution was sitting right across from me at the sewing day. Frankly, I was more worried about measuring the length of the binding at the time, and truthfully, right now, pookers don’t bother me. Next time, I’ll want to rip that out and redo it. Probably. Maybe. If you’re wondering, I kept in the stitching I did at the retreat. I mean, why was I worried about something that I cannot see well either due to my thread color matching awesomeness? I have more stitching to share from today and from Sunday, but I’ll break it up so I can scoot to Quilt Guild. 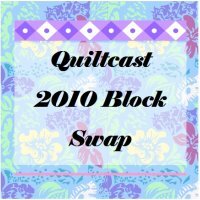 I have to say kudos, kudos to my swap partner for the quiltcast supergroup tilted four patch block swap. Actually, kudos to both of them, the one who made me my blocks, and the one who received my blocks. This was for the innaugrial Quiltcast Supergroup block swap. Block swapped: Tilted 4 patch. Most of the other swappers were done some time in november, but the swap deadline was January 8th, so realistically I had plenty of time before I was late. But me being me, seeing other people complete their swapping projects, made me feel under the gun, behind, a little slow. … And there is this whole ‘left brained quilter thing’. You see, I had read somewhere that to control the bias of a tilted block, that you can mount a template on with freezer paper. So I copied and cutout 4 x 4 triangle templates. And then proceeded to iron them onto the BACK of the fabric. Which this is leftover fabric for my hurricane top quilt. I specifically chose this fabric first, thinking of all the colors I could draw from. for the 4 patch. Actually these fabrics were laying out before I had my triangle templates, but you can see the fun I had here. Many options for something else in the future! Anyway, here’s a tip. When you make freezer paper templates do one of two things! I sewed my 4 patch together, matching them instead of actually going scrappy, using inspiration from the patches I received from Sandi. See, the blocks are tilted to the right. The four patch has leaned over to the right. When you put the template on the back, the blocks, when sewn, lean to the left. 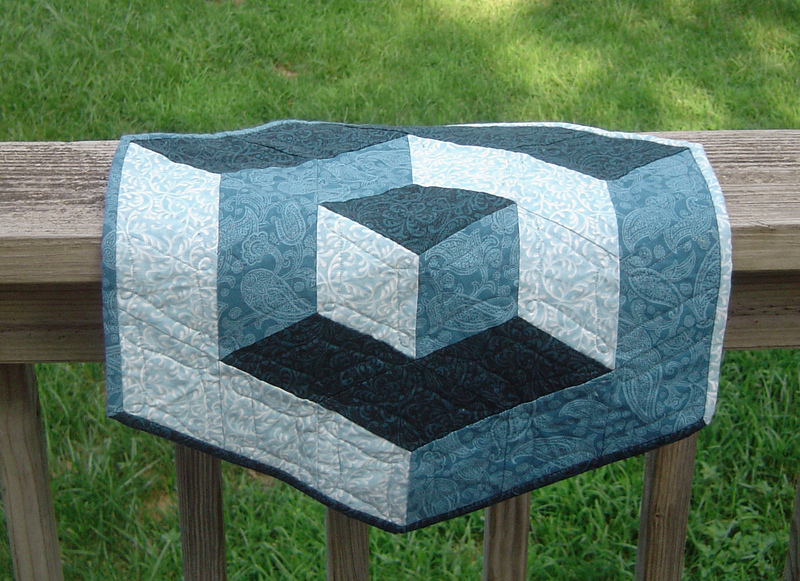 Left handed blocks from a left brained quilter. And the other thing I wasn’t so proud of was my seam allowances. Yes, the seam allowances were great on my triangles, they had a template with quarter inch marked (because I wanted to torture myself), but the center of my 4 patch was not quite so nice. Too small seam allowance on the blocks = too large of inner block = points just matching up to the edges, but once these blocks are sewn together to something else, the points are toasted! Watching square in a square ruler video, I had an idea to use her method for the tilted 4 patch to make it easier! And I could make these blocks tilt the ‘correct way’. I had to use my current blocks to get the tilt. Turns out these blocks are tilted 15 degrees instead of the more common 30 degrees. I could have also gotten the template out to figure out the tilt, but instead i used the block I already had done, but to work with it, I flipped it upside down. The block in the back that is facing right side towards the camera has extra fabric around the outside in rectangles, which are easier to sew. The block in the front is the block I was lining up to get the tilt correct! Here is a picture of the completed block, ready to cut. I had to line up my ruler straight on towards me and tilt the block behind it. And then rip with the rotary cutter. Square up, turn and repeat. For all 4 sides, for all 4 blocks. Downside: Now the bias is on the outside edge. I hope this doesn’t create too much problem later on. Starch it like crazy. Or fuse the block with freezer paper for stabilization. Moral of the story, check which direction you have the freezer paper, or you could be going backwards. Or left tilted for the left brained quilter! I made sure my partner got both sets of blocks, since one was backwards. Anyway, this was fun. On to the next swap!